Do your students have character? Of course they do! Whether they’re dreamers, go-getters, creative, methodical, caring, or super smart, they each bring something to the class. Celebrate and guide your students’ character development with the great resources and sweepstakes I have for you today! Looking for a way to prompt conversations about tolerance and self-acceptance? Wild About Us! helps kids ages 4–8 understand that everyone is worth celebrating, no matter what they look like. Warty Warthog has warts and tusks, elephant has a long nose, and Monkey’s ears stick out. Wouldn’t it be dull if all the animals at the zoo–and all the people in the world—looked alike? Read more here! Foster pride, learning, and creativity with free curriculum-based activities that will wow your students and make learning stick. (Science and slime coupled with Common Core standards? It doesn’t get much better!) And you’ll shine if you’re a winner in the Elmer’s Makes Learning Stick sweepstakes! You have six chances to win an Elmer’s monthly prize pack—glue sticks, glitter glue pens, Board Mate paper letters, and more—valued at over $250. Enter and get the free resources here. Let your students know that what they say—and write—really matters. Get free teaching resources—writing-project starters, print-and-use graphic organizers, and send-home activities—plus valuable coupons for Duck Tape® brand duct tape. Then enter to be the lucky teacher to win a $150 Duck Tape® brand duct tape prize pack, an iPad mini, and a $100 Visa gift card. 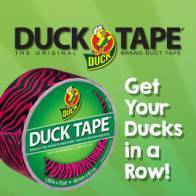 Five runners-up will each win a $50 Duck Tape® prize pack. Don’t wait; the deadline is April 30, 2015. Click here. Don’t forget; submit a comment for a chance to win the books! Absolutely love the Elmers contest because I love Elmers products. They are the best. Love the books and would love to win. I loved the Duct Tape activities. Love how you incorporated a variety of curriculum ideas into each “lesson”. It would be the Duct Tape, Elmers Glue and The Wild about Us as we love to read. That Elmer’s contest is great! I would so love to win their products! WOW! All the books are great for Responsive Classroom read alouds and the Elmer’s and Duck Tape are useful for classroom projects. I would love to win the Elmer’s glitter glue package. My kindergarten children are struggling with learning sight words. I would use the art materials to make sight words for my children to have hands on learning. I would love to win the duct tape and the elmer’s glue prizes (who wouldn’t) but found the premise of Wild About Us to be intriguing and may need to add that book to my library. Great resources and ideas! 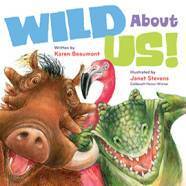 I would love to read Wild About Us to elementary students in class or library. 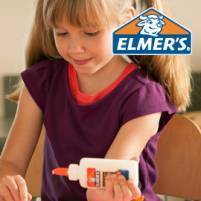 I love Elmers and can’t wait to see ideas and resources from entering their contest. I am not a big user of Duct tape, but always love to learn new things to share with students and colleagues. I entered the Duck tape contest and checked out the Wild About Us! site. My students need a little push in the direction of being more accepting of each other this year. I will definitely be purchasing this book. I would love to win the Duck Tape & Glue. I love the new designs and vibrant colors of duck tape. I use duct tape when we make our mini books by coving the staples so that little hands & fingers don’t get pinched by the staples. It allows me to color code the books according to our subjects or to match other topics & titles. Also I have several children who love to craft and we go through glue on a daily basics so the glue would be nice too. Books are absolutely always good to win I read several books several times a day and we can never have too books to read.